Awesemo.com’s DFS Lineup Builder is the premier tool in daily fantasy sports for hand-building Lineups (looking for a lineup optimizer instead? see below). 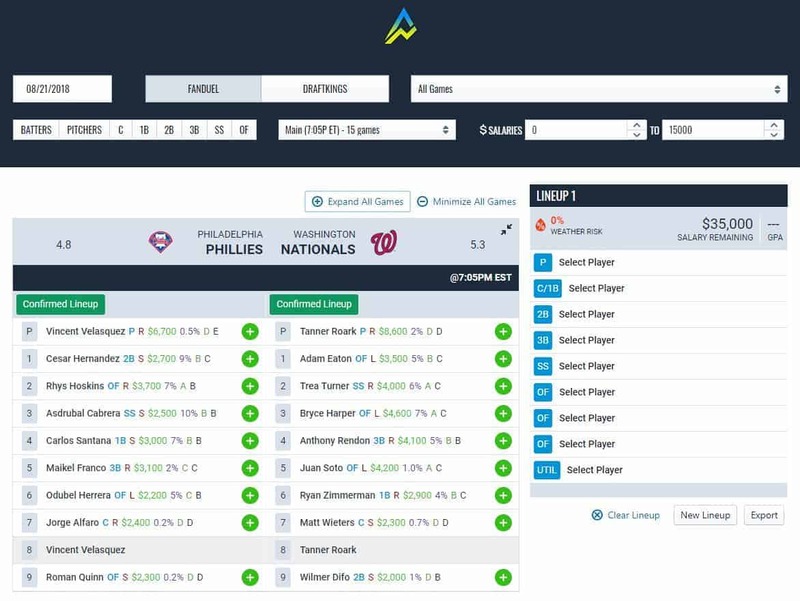 One of Awesemo.com’s most popular tools, and newly improved as of March 2019, it is has all the information you need to build your best lineup with Awesemo’s industry-leading expert ownership projections and rankings. It is a must have for every DFS player and makes building your lineups a breeze. As well as being the best DFS lineup builder available, it’s also the easiest to use! The Lineup Builder supports both DraftKings and FanDuel and all their NBA, NHL, MLB and NFL DFS contests. There’s no limit to the number of DFS lineups you can create and they can be quickly exported to complete your entry, or to be shared and strategized with members of the extremely helpful Awesemo community on our active Slack, YouTube and Twitter channels. The DFS Lineup Builder comes with any of our memberships. Sign up for an all-access membership using Coupon Code: LINEUPBUILDER and get 50% of your first month. For those that want to create multiple or batch entry lineups, or players looking to add greater sophistication to their game, Awesemo.com also offers Fantasy Cruncher, the number one mass fantasy sports Lineup Optimizer. Used by many of the highest-ranked DFS players, including Awesemo himself, we partner with Fantasy Cruncher to offer the industry-leading DFS Lineup Optimizer software as an add-on to our membership packages. To learn more about Fantasy Cruncher click HERE. Why Use Awesemo’s DFS Lineup Builder? Do you play the non-main slates? All-Day, Early, Night, Express? We support them all! Spend all your salary! You’ve got a salary cap, so use up as much as you can. Leverage our ownership projections to adjust how chalky or contrarian you want to be. “A” grade player with low ownership? Go for it! Check out our YouTube channelto learn more about the day’s match-ups, and then again for our live-stream right before lock to have any last-minute questions answered. And lastly, have fun! That’s what DFS is all about! You can find the Lineup Builder here! What does an ownership projection or ranking of “X” mean? This means there doesn’t exist a value yet. While the starting lineups are refreshed almost every second, the same simply cannot be done for our rankings and ownership projections where both are extremely time-intensive processes. There will therefore be intervals when lineups change significantly that these values will be missing and will likely come in the next update. What is the contrarian/chalky rating? Based on the projected ownership of your lineup, we let you know how we think it compares to other lineups in the field. Playing a top heavy 20k entry GPP? You may want to be more contrarian. Playing a 10 man? You may not need to be as much. The value will change based on the slate size so make sure you choose the correct slate. The GPA is a salary-weighted rating of how well you spent your salary. Spending more of your salary will increase this value, along with a proper balance of lower cost value players mixed with expensive stars. Use our rankings, ownership projections, and articles in congruence with the lineup builder for optimal results. To access our premium content, become an Awesemo.com member. Code LINEUPBUILDER gets you 50% off the first month. Hi, are you still having issues? Which link are you clicking on? Hi, which link are you clicking on? Are you still having issues? what are the ranges of GPA? What is a good GPA and a bad GPA? Is there a tutorial on how to use The Lineup Builder? Like which letters are better to choose? Which letters are We suppose to choose for lineups? Is there a way or will you offer the ability to save lineups in the Lineup Builder? I made a few lineups. My computer was running a little slow, so I closed the window, then ran speed test, speed was good. Went back to site and lineups were gone? I know you can export them, but the ability to save on that page would be nice. Thanks!